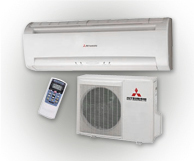 Commercial Air Conditioning Aircon247.com | discount portable air conditioning, fixed air conditioning, easy install air conditioning. Our wall mounted split air conditioners are designed for style & functionality and offer an efficient and cost-effective way to create a comfortable environment. As well as cooling in summer, these systems can also heat by drawing energy from outside, even at temperatures down to -15°. 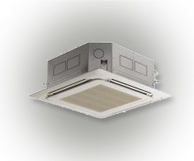 Ceiling cassettes are ideal on both an aesthetic and practical level. 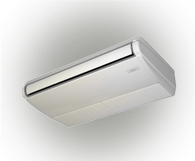 Designed for installation into a suspended ceiling, cassettes offer the optimum in air-conditioning technology and are the ultimate in convenience for any commercial space. These air conditioning systems allow management of the temperature in several rooms at once, with individual control of each indoor unit. You can connect up to nine indoor units to a single outdoor unit and in doing so reduce power consumption costs by up to 35%. 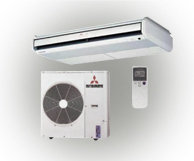 Floor mounted air conditioning systems are usually fitted in similar areas to where radiators would be, blending into your room, whether a classroom, hotel room, office or any other space, and will offer convenient temperature control in hot and cold conditions. The ideal solution for larger rooms, shops or offices without false ceilings. The indoor units can be installed quickly directly to the ceiling with minimum disruption as they are lightweight, slim and extremely quiet. The swing louvres create a steady flow of air over a wide area, making them economical and effective. Universal systems can be installed at floor or ceiling level without modification and with minimum disruption to the room. 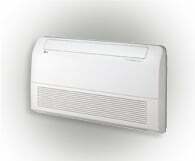 They are extremely quiet and energy efficient, making them ideal for commercial or private premises.